Megeve is rightfully considered one of the most prestigious ski resorts, besides that it is famous for its beauty. The town with its exquisite architecture and cobbled streets is surrounded by high mountains and fir forests. This attracts visitors from all over the world. Since 2004 Megeve is a member of the prestigious ski club «Best of the Alps». Megeve is one of the most world-known and picturesque ski resorts. It was built in the 1920s as an alternative to St. Moritz, and since then has the reputation of an expensive and prestigious resort. If you want to relax in a high class atmosphere, while not experiencing a shortage of oxygen, skiing on excellent well-done tracks, Megeve is waiting for you. Megeve is located in the south-east of France, near Mont Blanc in the French Alps on the very border with the department of Savoy. Megeve is situated quite near Mont Blanc (4807m), but the height of the Alps at the territory of this ski resort is relatively small and reaches 2350m. 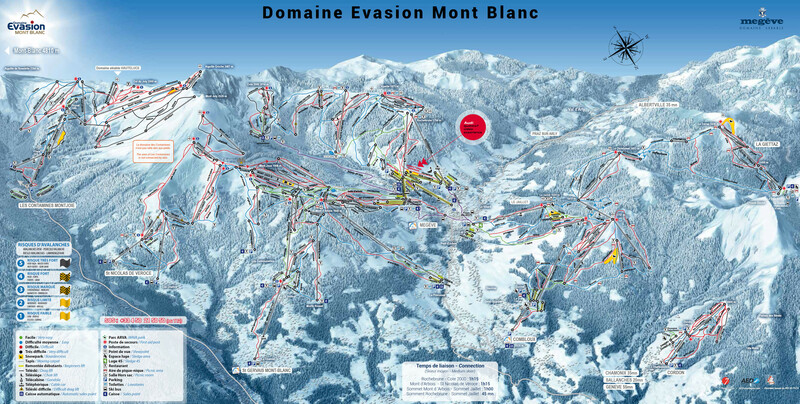 Megeve is a part of the Evasion Mont-Blanc ski area with a total length of 445km. Megeve's own skiing area includes three zones: Massif de Rochebrune - Cote, Massifs Mont d'Arbois and Massifs Le Jaillet-Christomet, each of which can be reached by a lift from the centre of the village. Alps2Alps always offer the most comfortable and reliable transfer services for our customers at all time of the season. Be sure, that transfer prices will be the most beneficial. The base price of ski transfer will be minimal and most beneficial. We never overstate prices for our customers. To save money the most, we recommend you to book the transfer for working days or after the high season, because on weekdays (from Monday to Friday) Alps2Alps usually make a transfer discounts up to 60%. We message you that the final cost of your transfer will be also dependant on such factors as availability of the vehicle, transfer schedule and other costs, for example, toll roads and airport parking charges. If you are going to travel as a part of a larger group and you have any additional requirements, please contact us to discuss all details of your trip. In addition to the skiing in Megeve itself (445km of piste ski runs), the appropriate ski Lift Pass will allow you to ski or snowboard in the other Ski Pass Mont Blanc ski resorts of Argentiere, Chamonix, Combloux, Cordon, Le Tour, Les Contamines, Les Houches, Passy Plaine Joux and St Gervais Mont-Blanc. Do you want to spend a family holiday? Or going on an adventure trip with your friends? Rest at the resort Megeve is suitable for everyone. Perfectly prepared and carefully marked trails, designed for all categories of skiers, developed tourist infrastructure, an excellent system of lifts - all this makes Megeve an excellent resort for both profs and beginners, for family rest and friendly companies. As you know, as the high ski season is coming, the prices for transfer services to the most popular destinations are also growing, and very quickly. We advise you to book your transfer to Megeve in advance to get the most beneficial price quote. Don’t delay it for tomorrow - book your transfer right now! Notice, that if you can’t find any information, a resort or a service on the website, be welcome always to call our customer service specialists for help. Just contact us, and you will be given all the information about ski transfers that you need. Guarantee yourself the amazing start of your vacation time with the Alps2Alps!